just as it looked online. Works perfectly. 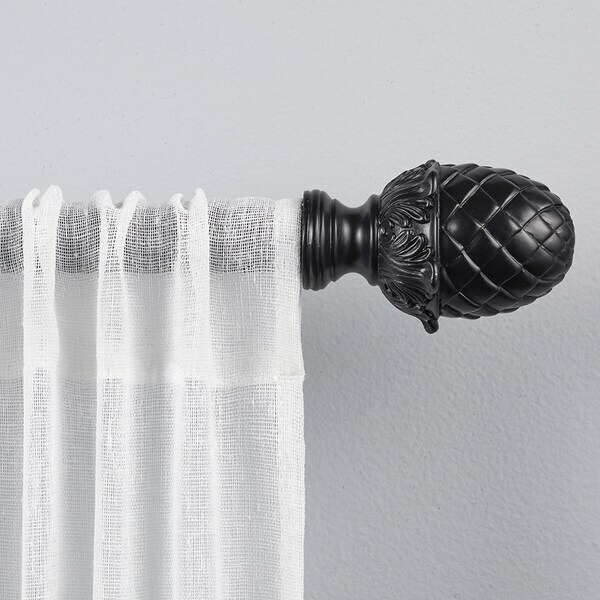 The Acorn decorative curtain rod and finial set features a classic style and traditional design with a matte finish iron rod and coordinating cast resin acorn finials. This set will provide a visually balanced appearance for your window treatments. The 2.6" diameter x 3.9" long finials will insure that your window curtain panels will remain securely on the rod. The 1" diameter iron adjustable curtain rod is designed to fit a wide range of window widths, and has a sturdy 25 lb. capacity that will support flowing sheers to thermal blackout panels. The 3.5" fixed depth projection bracket provides a gracious amount of space for fabrics to drape perfectly. Accommodates window curtain panels and drapes that are designed with various tops, including: rod pocket, pinch pleat, grommets, tab top, or hidden back tab top. Provides an attractive accent to every window treatment in your living room, bed room, bathroom, kitchen, and kids room. Installs easily with included hardware and installation instructions. Sturdy, easy clean, no fuss, wipe clean finish will last for lifetime. This window curtain rod and finial set will add the perfect finish accent to any window treatment and adds a refined style to your home decor. This rod looks very rich. The pineapple is a sign of peace and fits well with the curtains. I am only giving it two stars because the product arrived broken. One of the finials arrived in many pieces. I can not rate the quality of the curtain rod, however, Overstock was quick to give me a refund so I give Overstock 5 stars. This is a nice, sturdy metal rod that was more substantial than I was expecting, especially given the cost. I bought for one room then went back and bought for several more. Exceeds expectations! My curtain rod showed up with one corner broken off and no brackets to hang it. 3 strong brackets make it accross a sliding glass door and, holds up heavy grommeted drapes. I will not buy again As the finials are plastic and break easily!